I am still working in the New Room. I should soon start to call it the den because it’s far from new. 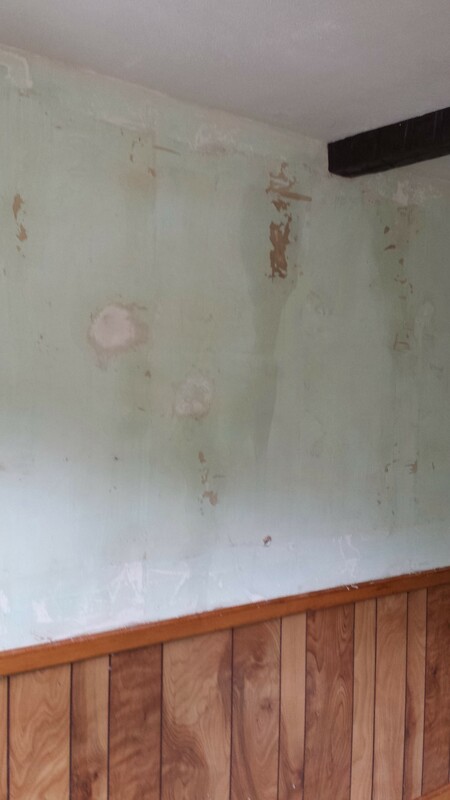 I finished stripping the wallpaper and am now firmly convinced that menopausal women should have a mandatory stopping point on wallpaper peeling at somewhere less than 8 solid hours, or insanity sets in. Next, I had to assess the order of painting, and the colors I wanted to use. I wanted the wainscoting to be a solid color, chair and base rails to be white, and the upper previously-papered portion painted with a decorative wash. I like solid color, but there are so many imperfections in these walls, and I have so many different colors to incorporate, that the mottling seems to be the way to go. I can always change it if I want. 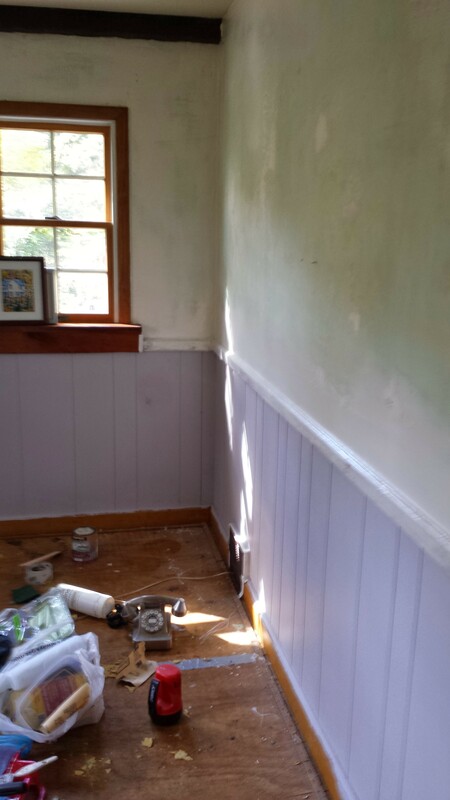 Because the wainscoting requires that I really push the brush into the crevices, I did that first, on Friday right after work, in a purple-grey taupe (purchased at BigBox) to match the carpet. I used Construction Gear’s new premium 4” paint brush for greater control. The edge on this brush is so precise that I cut in the wainscoting without needing tape – the bristles went to the very edges and I gently pushed the paint right to the trim. I am impressed. For my white, I mixed the rest of the Bullseye Primer with all the leftover white paint I found in the basement. 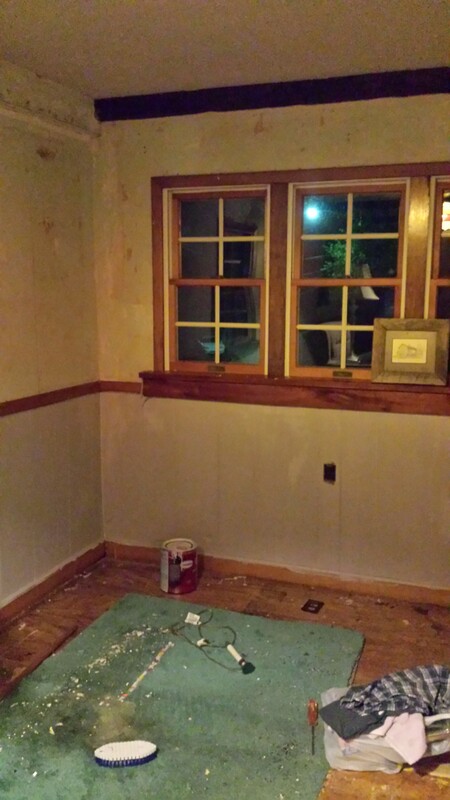 While allowing the wainscoting to sufficiently dry, I spackled and sanded the walls smooth best I could. I then painted the rails with this white, using the great brush again. I extended the white to the patched upper walls using Construction Gear’s Purdy paint rollers. Saturday was too beautiful to be indoors, and Andy and I enjoyed one of the best days, ever. I started the morning with about 6 hours of painting, then we went for a 5k hike along Lucy’s steep cross country training course and truly appreciated her running. After we caught our breath, I treated Andy at a nearby coffeehouse. We sat outside under an umbrella and talked leisurely and even got refills! In the frenetic pace of our lives, this felt incredibly decadent. Then he was back to shuttling the girls while I painted, and we touched base again in the evening for the game on TV. On Sunday I started the decorative painting over the white walls. I applied the taupe using a dry brush and damp rag to smooth it all, bringing out the texture of the wall. I allowed that to dry, then went back and did the same with a satin beige (a quart found in the basement). I like the organic look of it all being very well-blended, like a fine leather. I finished almost all of this over the weekend, but on Sunday, while I was waiting for a visit from Mo, I got a call from the hospital, that she had been taken in for being dizzy (ok, she and I are both dizzy, but this was the bad kind of dizzy!). In a nutshell, she had missed one of her medications for about a month. I will need to start checking in on her more often, in her apartment. On my way home from that, I had time to stop at Andy’s for about ten minutes, to rest in him and end the weekend on a relaxing note. Andy suggested that I paint the window frames and sills white to update the room further. I will do that, as well as add the final coats to all paint, this weekend, and call it a light weekend. 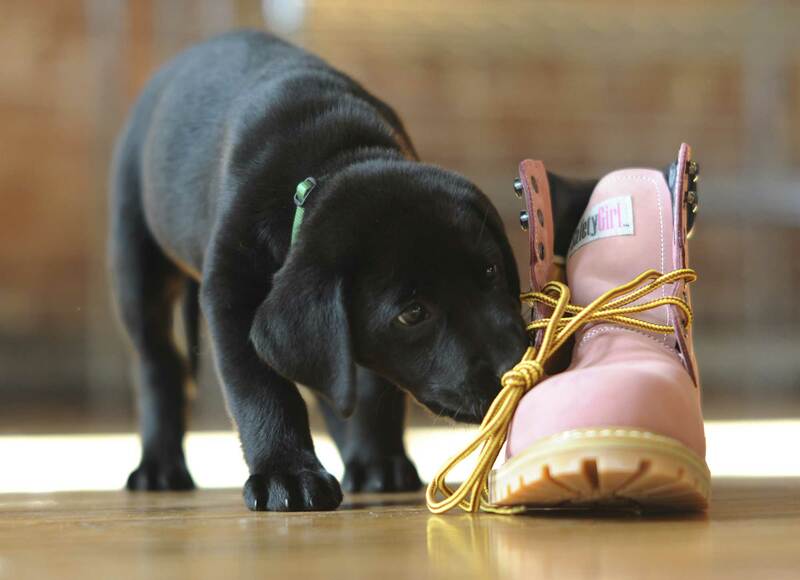 I need one of those!